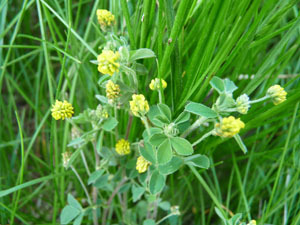 Introduced from Europe and Asia this annual/biennial weed was used as a means to improve soil conditions and as a forage crop that quickly escaped cultivation. This plant grows well in poor soil because it takes nitrogen from the atmosphere and replaces nitrogen levels in the soil. Distinguishing Features: Trifolium campestre (low hop clover), is very close in identity to two other hop clovers, the Trifolium aureum (hop clover) and Trifolium dubium (least hop clover). Although all are edible, the below descriptions are in reference specifically to the Trifolium campestre. 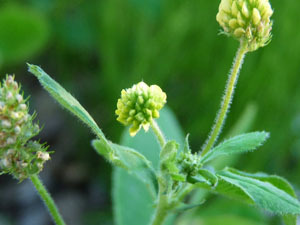 There is another very close look-a-like called black medic (Medicago lupulina). What sets the hop clovers apart from the black medic are the seeds. Hop clover flower heads turn into brown seeds and black medic flower heads turn black. According to Dr. James Duke the leaves of the black medic are high in protein. Flowers: Hop clover flowers are yellow, almost pea-like. A single round to oval flower head on a short stalk rises from a leaf axil. Heads measure average 1 to 2 cm long, densely packed with tiny yellow pea-shaped flowers that turn a creamy colour then light brown before going to seed. Fields of Nutrition has medicinal benefits and vitamin/mineral content of Hop Clover. Leaves: Leaflets are 1-2 cm long; lanceolate to oblong in shape. Hop clover leaflets are unlike most other clovers in that the center leaflet is on a stalk. Leaves are slightly serrated around the edges. Height: This plant can grow between 15 and 30cm in length depending on various conditions including location. Habitat: Found in lawns fallow fields, waste ground, lawns, pastures, open woods, and along roadsides. 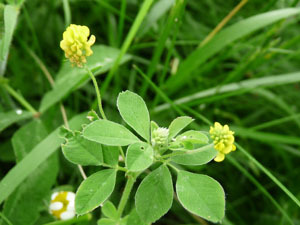 Edible parts: All types of clover have been eaten raw and cooked by First Nations people. 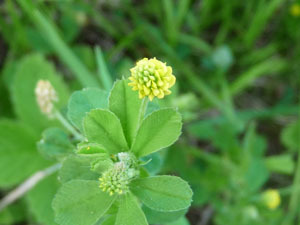 Although very little information exists for this type of clover, what is known it that the flowers, leaves and seeds are edible. Flowers can be put into teas. Seeds (in autumn) can be collected and eaten as is or roasted. They can be ground into flour as well. Leaves can be tossed into salads. Other name: Low Hop Clover. Similar plants: Least Hop Clover, Black Medic.